Whatever the time of year, you can always find a festival in Abruzzo. These festivals are rich with local culture and traditions and are the highlight of the year for the locals. Picciano - Traditional Befana Festival. Rivisondoli - a living nativity scene during which hundreds of people reenact the events of Epiphany. Fara Filiorum Petri - the Farchie Festival in dedication to St. Anthony. Città Sant'Angelo - carnival parade of floats in February. San Valentino Good Friday festival called the Frittata Festival. Cocullo - the Snake Handlers' Procession during which a statue of St. Dominic covered in live snakes is carried through the town. Loreto Aprutino - the Procession of the Ox on the Monday after Pentecost. Rocca di Mezzo - the Daffodil Festival to celebrate the arrival of spring. Villamagna - The Turks and St. Margerite historical reenactment festival. Cappelli Sul Tavo - the Palio del Pupo Costumed Races. 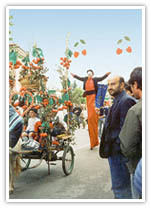 Cepagatti - a historical parade with floats, fireworks and celebrations. Cappelle Sultano - the Palio of the Puppets. Celano - a costumed procession with fireworks. Popoli - the Trout and Shrimp Festival. Lanciano - a medieval pageant and horse race. Pacentro - the Festival of the Madonna of Loreto. Villa Santa Mariah - Culinary Festival during which world class chefs in the region demonstrate their skills over a three day period. Scanno - Bonfire Festival to commemorate St. Martin.